Syrian refugees or displaced Syrians as Lebanese authorities still refer to them, face another storm season as their tents are flooded by water and covered by snow. 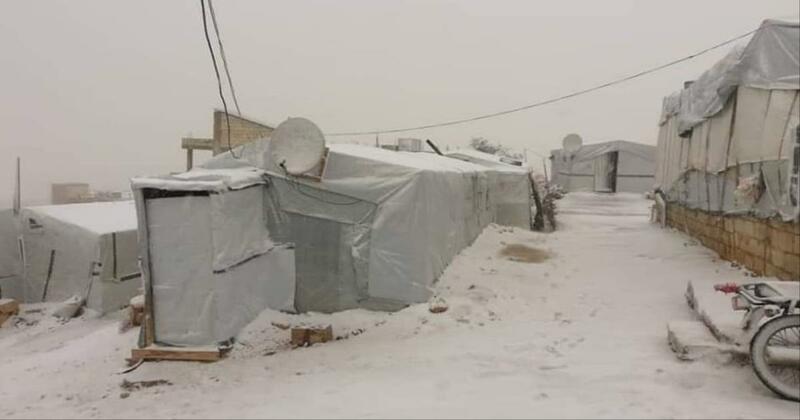 As Lebanese residents in the Bekaa lament the shortage of heating in their homes, we can only imagine the state of Syrians living in tents surrounded by layers of snow. When faced with the wrath of nature, the only thing humans can do, is attempt to resist. That is how humanity has survived so far against the weather. For Syrians whose circumstances have thrown them back decades behind, they stand today helpless against the brutal winds; Particularly those who have been taken in by neighboring countries who have championed their cause for a combination of these two reasons. These countries seek both to gain the highest amount of international aid, as well as strategize their position when it comes to the future of Syria and the politics of the region. However, each winter passes by and exposes the hypocrisy of the host governments and their failure to provide the most basic essentials to the refugee community fleeing the madness of war. Official and non-official camps alike have been developed with no foundation or infrastructure to support any electricity, water, or sanitation in a proper way. Al-Rikban camp, located on the Syrian-Jordanian border, is the biggest example of destitute locations chosen to host refugee camps. The children of this camp suffer from numerous intestinal diseases as a result drinking muddy water, as well as their open-air habitat in the middle of the Syrian Desert. The neighboring Zaa’tari camp is not completely different even though it is the largest refugee camp in Syria and is among the largest in the world. Having slightly better living conditions, the Zaa’tari is gradually expanded in a semi-structured way, but the climatic zone in which the camp is located makes it one of the coldest locations since it resides in the middle of the desert, of the Jordanian province of Mafraq, with temperatures altering drastically between day and night. In Lebanon however, Syrians remain classified as displaced instead of refugees. This is because of the fact that the Lebanese government does not wish to repeat the case of Palestinian refugees whose civilian presence till this day has not been settled. Syrians have spread out throughout all Lebanese territories, but today those who suffer the most are the ones who have settled in the Bekaa area, and are living in the most severe weather conditions. These Syrians have resorted to spreading salt on their tents to prevent them from freezing. Yet it is difficult to imagine the salt withstanding storms with speeds of 90km/h, and snow-fall as low as 600m above sea level. Over the past months, Lebanon has witnessed a series of disputes over the issue of the repatriation of Syrian refugees. General Security has described the return as “voluntary” despite the distribution of leaflets to camp residents asking them whether they want to return or not. On the other hand, the local Lebanese media, on a weekly basis, announce the days for scheduled voluntary return to Syria while the means of transport of return were the same green buses used by the Syrian regime to move its opponents towards Idlib. Some believed that there is no solution other than the return of the refugees. The economic conditions in Lebanon are unsustainable and the combat in Syria is waning. In a few days, Arab leaders are expected to arrive to Lebanon to attend the Arab economic summit. The Syrian invitation was the main preoccupation of political poles while Lebanon distanced itself from the issue which doesn’t fall part of its duties. However, it is difficult to say Lebanon has distanced itself from the crisis lately; Hezbollah’s interference has caused the death of thousands of Lebanese youth, and they have contributed severely in the increasing sectarian strife in Syria. The Media meanwhile still wonders daily where the relief money was spent, since a couple hours after the storm, results were catastrophic on the refugee community. The storms in the Levant may be a necessity to sustain life in this part of the world, but it undoubtedly exposes the corruption of systems whose people drown in the floods annually as they do in Jordan. These winds move cars from their place, and cause sewage pipes to explode-flood the streets, and pours salt on the refugees’ hitherto untended wounds.